Phoenix Robotic works with you to ensure that you get the best of your return on investment (ROI) on your robotic welding systems. Welding is one of the most important parts of the industrial sectors. Using robots is considered as the safest way for dangerous works like wielding. This system has spread its wing a lot. Robotic welding systems are no longer just for large manufacturers; it also offers benefits for small enterprises. Robotic welding is an automated process that improves productivity and weld consistency to lower costs for production, labor, materials and it also helps companies gain a competitive advantage over those businesses that have not made the transition to automated robotic welding. Lots of reasons are there for the increasing demands of the robot welding system. The decision to adopt robotic welding systems is getting easier every day because the lack of skilled welders available to fulfill the requirements of large and small companies. They can also gain greater flexibility through adding automation. Particularly SEMs are beginning to make the investment in this technology and realizing positive results. It helps them to save lots of time and money. But, this robotic stem is little different from the other ones. 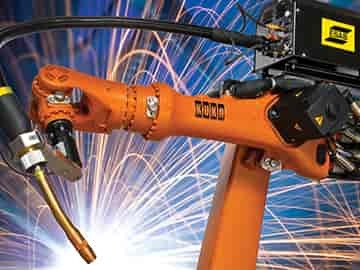 There are some key considerations to make before adding robotic welding systems in your company. 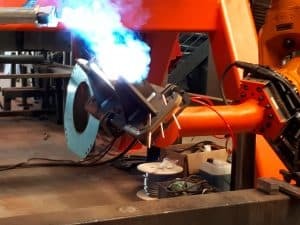 It is important to ensure that the parts to be welded are appropriate to an automated welding process, selecting the right system, physical space and training welding operators properly are just a few factors that can help companies gain the best in efficiency and maximize the return on investment. Robotic welding systems offer consistency and repeatability of the welds produced. A robotic welder is more consistent and can move from one weld to the next quickly, speeding up the entire process. Lower production costs by reducing labor requirements. You can have a good welder supervising the work of several automated cells instead of having to find and train a lot of welders for the job. Reduce the time and money spent on rework. Lower production costs by reducing waste materials. After knowing such benefits of the robot welding system, people are installing this technology in their industries. The reason behind it is very clear. Even though companies have the idea that robots are difficult to program, they soon learn that robots are easier to program and that in the long run, it’s easier to train someone to operate the robot than teaching somebody to weld. Now, however, a team of students at the Delft University of Technology (TU Delft) in the Netherlands has taken another approach – they’ve created the world’s first stainless steel bike made via a welding-based 3D-printing technique. The students want to demonstrate the potential of the robot welding technology. Some complicated and simple processes are involved in the programming of a robot. Programming a robot involves teaching and playback by driving the robot from point to point from the teach pendant or controller, using either plus or minus keys or a joystick. The operator doesn’t need to memorize any code. It will also support the human health, safety, and employment costs.